“When I grow up I want to be an astronaut!” declared a six-year-old Stephan in 1968, a year before man walked on the moon. Not surprisingly, his first doodles featured blazing rockets and spaceships. Growing up in France, and not permitted to watch much TV, Stephan spent a lot of time at the corner cinema. There he was introduced to the likes of the Werewolf, the Mummy, Dracula, Frankenstein and King Kong. He traveled on the Voyage to the Center of the Earth and experienced The Day the Earth Stood Still. The fantastic creatures and worlds in all of these classics were overwhelmingly cool. As Stephan’s doodles of astronauts became doodles of monsters and aliens, he found himself enjoying drawing more and more—and the dream of becoming an astronaut gradually evolved into becoming a visual artist. 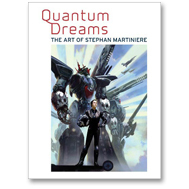 Quantum Dreams: The Art of Stephan Martinière is a collection of his scifi book paintings, video game designs and personal art. Stephan takes others’ descriptions of faraway, imaginary realms—and makes them real. Categories: Books, sorry you missed us // out of print. Tag: stephan martiniere.